U.S. Negotiator's Plan For Iran Nuclear Deal: Tweak, Don't Delete : Parallels NPR's Steve Inskeep talks to Brian Hook, the U.S. diplomat who is leading negotiations with the Europeans over the 2015 Iran nuclear deal to make it more palatable to the Trump administration. 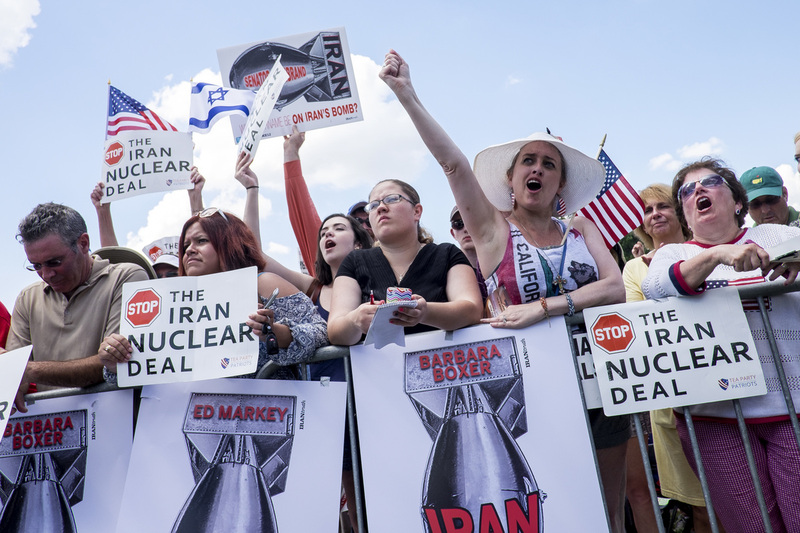 Attendees hold signs and cheer during a Tea Party Patriots rally against the Iran nuclear deal in Washington, D.C., on Sept. 9, 2015. In an interview with Morning Edition, Hook detailed the U.S. diplomatic strategy as a deadline nears for action. The Trump administration has until May 12 to renew sanctions relief for Iran, as the deal requires. President Trump has continually railed against the agreement — signed in 2015 by the Obama administration along with Britain, China, France, Germany and Russia. He has threatened the U.S. might withdraw but said Tuesday "nobody knows what I'm going to do." Iran's Foreign Minister Mohammad Javad Zarif told reporters Saturday it is "highly unlikely" Iran will keep the deal with the remaining world powers if the U.S. backs out. Rather than let the deal unravel, Hook and European diplomats are discussing new measures that might persuade Trump to keep it. "It's common for one [arms] deal to be improved upon or supplanted by another deal," Hook said. Iran's Zarif says his country is not interested in negotiating new restrictions—but strikingly, the U.S.-led diplomatic effort does not contemplate negotiating with Iran. Hook said Western diplomats instead are discussing new measures they might jointly impose on Iran. "We're trying to address the deficiencies of the Iran nuclear deal," he told NPR. "Over the last few months we have been working pretty diligently with the British, the French and the Germans on achieving a supplemental agreement that the president has requested that would address a lot of the problems that we have with the existing deal." New measures would include extending restrictions on Iranian nuclear development, parts of which begin to expire in 2025, he said. "We also want to address Iran's intercontinental ballistic missile program and we need to deter Iran from its adventurism in the Middle East, which has destabilized the region," Hook added. Trump's European counterparts have expressed far less enthusiasm about further pressuring Iran. United Nations inspectors have said Iran is keeping its end of the bargain. "The U.S. and France understand each other," Hook said, echoing remarks from Trump after his meeting on Tuesday with French President Emmanuel Macron. "They discussed paving the way for a new agreement," Hook said of the meeting. European diplomats speaking to Reuters said they are making progress in convincing Trump to amend the current deal, rather than tear it up. The U.S. State Department official said they need more time. "A lot of work remains to be done," Hook told NPR. "It's too early to tell if we'll be able to reach an agreement with the Europeans. We still have some gaps to close"
Iran's leaders are bothered by the talk of tinkering with the deal. President Hassan Rouhani said of Trump, according to Reuters, "How can a tradesman, a merchant, a building constructor, a tower constructor make judgments about international affairs?" Iran has already complained that the United States has violated the spirit of the agreement by making it difficult for Iran to enjoy economic benefits. Hook spoke days before his next boss, Mike Pompeo, is expected to be confirmed as secretary of state. Pompeo has fiercely criticized the Iran agreement. Hook himself described the deal — officially called the Joint Comprehensive Plan of Action, or JCPOA — as something less than a formal "agreement." "This JCPOA is not a treaty, it's not an executive agreement. It has no signatures. It has no legal status. It is a political commitment by an administration that's no longer in office," he said. The agreement was never ratified as a treaty, although after its negotiation by the Obama administration it received backhanded approval by Congress. Lawmakers never voted to approve the deal, but narrowly voted not to reject the act of the president. The suggestion that the Iran deal was not binding drew immediate skepticism from some analysts and experts. Jonah Blank, a former aide to ex-Secretary of State John Kerry, wrote on Twitter that the statement was "exceptionally dangerous" — and not just for the Iran deal or the potential impact on North Korea. "If nations can't trust U.S. commitments made 'by an administration that is no longer in office,' then every pledge is valid for only four years," he tweeted. Beyond the legalities, practical questions loom about what happens in a dangerous region if the deal should fall apart. The 2014-15 talks by the U.S., Iran, Russia, China and European powers brought an end to a years-long crisis as Iran enriched uranium amid fears it would seek a nuclear bomb. On Wednesday, a Kremlin spokesman expressed doubt about revisiting those uncertain times. "We support the nuclear deal as it is today. We think that there are no alternatives," said the Russian government spokesman, Dimitry Peskov. "The nuclear deal was the meticulous work of a number of countries. Is it possible to repeat that work — that is a question."